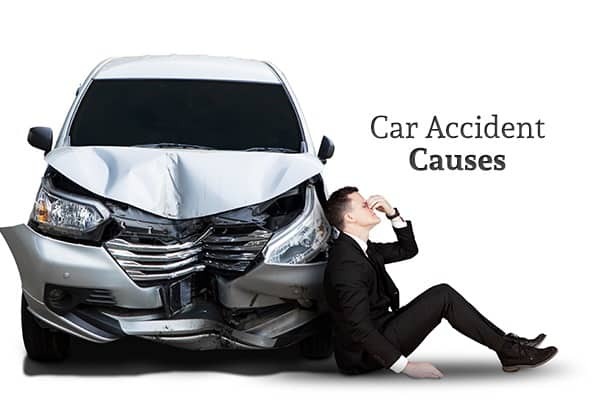 Home » Blog » What Are The Most Common Causes of Auto Accidents? A shocking 37,000 Americans die in car crashes each year, and more than 2.35 million are injured or seriously disabled. These crashes are caused by just about anything and everything, but when analyzing the most common causes of car crashes, some clear patterns emerge. Read on to learn more about the top causes of car accidents and how the circumstances of an accident could affect a potential personal injury claim. Currently, distracted driving tops the list of auto accident causes in the U.S. These distractions can take a number of forms, including eating while driving, texting, talking on the phone, turning to speak to other passengers, putting on makeup, or even changing the radio station. Road and traffic conditions can change almost instantly, so spending even just a second or two with your eyes off the road can put you at risk of an accident. Some types of distracted driving are against the law. Just about every state has placed restrictions on cell phone use while driving, with some states prohibiting all but “hands-free” cell use while a car is in motion. As of September 2017, Texan drivers are subject to a total cell phone ban while behind the wheel—which means that texting, reading, dialing, and many other actions that cannot be done hands-free are now against the law. If a driver injures you while they’re using their phone, they could face heightened liability under Texas law. By showing that this person was breaking the law at the time they struck you or your vehicle, it becomes far easier to establish negligence. And with today’s sophisticated cell-phone technology, it’s easier than ever to check a person’s call log or even their wireless “pings” to establish that they were texting, reading, or talking while driving. In any car crash in which cell phone use may have been a factor, your attorney may issue a subpoena to the defendant’s cellular provider to determine whether distracted driving played a part in the auto accident. Another illegal activity that is the cause of a high number of car crashes is drunk or drugged driving (DUI). Getting behind the wheel after drinking or doing drugs can slow drivers’ reflexes and reaction time and render someone more vulnerable to distractions. Even a single beer can often place one’s blood alcohol content over the legal limit. In a sad irony, sober drivers who are hit by a drunk driver are far more likely to suffer serious injuries or fatalities than the drunk driver themselves. Anyone who consumes any mind-altering substance and then gets behind the wheel can put themselves and others at serious risk. Speeding is another behind-the-wheel behavior that can put drivers and passersby at risk of injury. The faster a vehicle is traveling, the more stopping distance it requires—which leaves drivers far less time to avoid a sudden object in the road or a car that stops short just in front of them. Swerving to avoid an accident can put drivers (and others) at risk of rolling over or crashing into something on the side of the road. But what constitutes an “unsafe speed” can often depend on the circumstances and road conditions. On a clear, sunny, low-traffic day, even exceeding the speed limit may not be dangerous. But on a rainy day with low visibility or while traveling on a road littered with gravel, sand, or grass, going just under the speed limit may still be too fast. Proving that another driver was traveling too fast for the conditions can be an important step in establishing negligence. Inclement weather can disrupt traffic and make certain driving times more dangerous than others. Much like driving too quickly for the conditions, failing to pay attention and respond to poor weather leads to many crashes each year. Defective or recalled auto components can affect the way the engine, transmission, brake, and other important parts of a car function, which sometimes leads to accidents. In these situations, an injured plaintiff can add the manufacturer or servicer as a third-party defendant, potentially recovering damages from both the driver who hit them and the manufacturer. If you or someone you know has been injured in an auto accident, you should contact a lawyer immediately. The skilled attorneys at Machi & Associates, P.C. will be able to give you compassionate and up-to-date legal advice so you’ll be able to make an informed decision. Give them a call at (817) 335-8880 or fill out the short contact form on their website to schedule your free consultation.